This is the ultimate guide on how to make perfect French macarons. 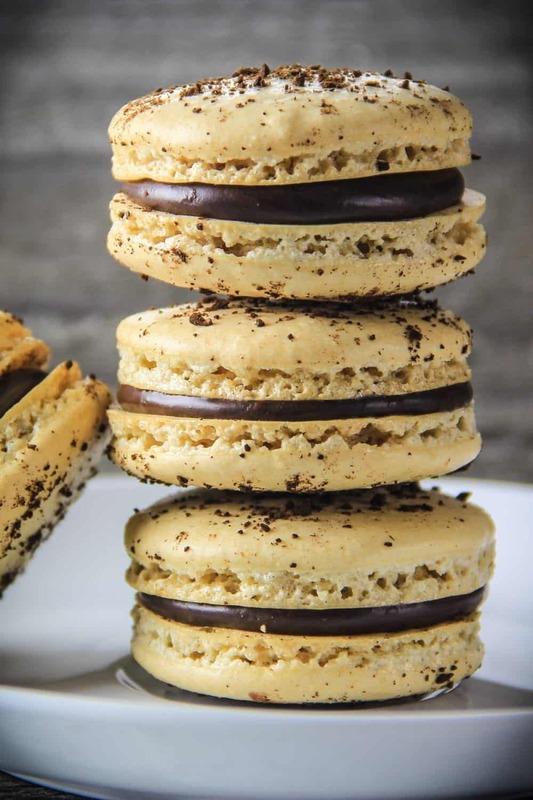 This coffee macaron recipe is full of espresso flavor and a smooth chocolate ganache. Macarons can be a little finicky. This is something that takes practice and a lot of patience. After making my raspberry macarons so many times, I’ve come up with a list of tips to follow so you too can make a perfect macaron. This recipe was originally posted on Apr 15, 2015, we’ve tweaked it a bit since then. Sift the almond flour and powdered sugar into a bowl and mix gently. Whisk egg whites on medium-high speed until foamy. Then add cream of tartar, salt, espresso powder, and sugar. Continue beating until stiff peaks form. Gently fold dry ingredients into the stiff egg whites. You’ll want it to look like molten lava. Place a Wilton 2A tip in the pastry bag and pipe small circles of the coffee macaron batter onto a baking sheet lined with parchment paper. You can sprinkle some coffee grounds on top while the macarons are still wet. Leave them out for 20 minutes until they are tacky to the touch. Bake at 300 degrees Fahrenheit on the conventional setting for 18 minutes, one tray at a time. When making macarons you want to use room temperature ingredients, especially the eggs. I even make sure my mixer bowl is at room temperature. I keep my mixer on a shelf in my garage (which is really cold). To bring it back to room temperature I let the outside of my mixer bowl run under hot water for a minute. Make sure to sift the almond flour and powdered sugar. Don’t use a super fine sifter. I’ve tried using a super fine mesh sifter thinking it would give me those perfectly smooth macarons, but instead it prevented my macarons from forming the “skin”. If a macaron doesn’t have that “skin”, it won’t rise to form the ridges at the bottom. Let the macarons sit in room temperature for at least 20 minutes or until they feel tacky to the touch. Think of a glob of glue that’s been sitting for a while. It’s still wet on the inside but if you lightly press it with your finger, it will feel dry. If you live in a humid area it will take longer for your macrons to form that “skin” on the outside. You don’t want to over beat or under beat the egg whites, A good way to know if your egg whites are beaten well is if you lift the beater upright and the egg whites stand still instead of curving over. When combining the flour to the egg whites, you want to gently fold it instead of just mixing it because you want the egg whites to retain as much of their volume as possible. I like to use a large rubber spatula so that it folds more of the batter with each turn. The consistency of the batter should look a lot like molten lava. Not too runny, and not too thick. 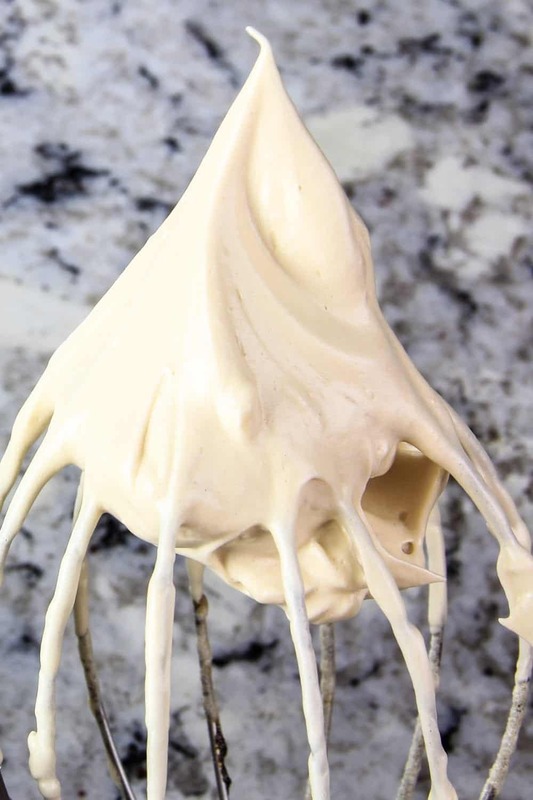 When I pipe out the batter, I don’t swirl the tip. I just keep it in one place until there’s enough piped out for 1 cookie. Once all the batter is pipped out unto the parchment paper, take the tray and bang it really hard on the counter to release any air bubbles. This will help those feet form. Bake each tray 1 at a time in the oven. Since one tray is in the oven first, the other tray becomes drier. To prevent the second tray from being too dry, remove it from the oven a minute or two earlier than the first. 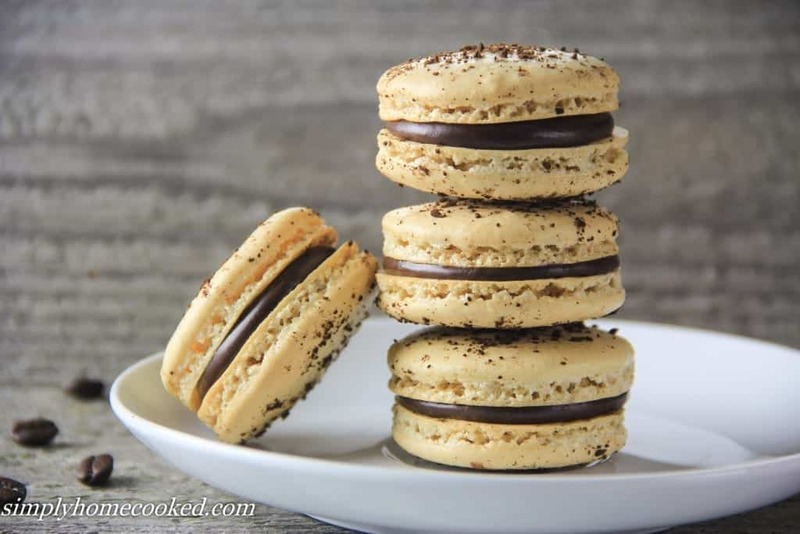 What piping tip to use for coffee macarons? I find that a Wilton 2A round piping tip works the best for making french macarons. Pour the heavy cream in a saucepan and let it come to a simmer over medium heat. Place the semisweet chocolate chips into a bowl and pour the hot heavy cream over them. Let the chocolate sit for a few minutes then stir until it becomes a smooth creamy consistency. 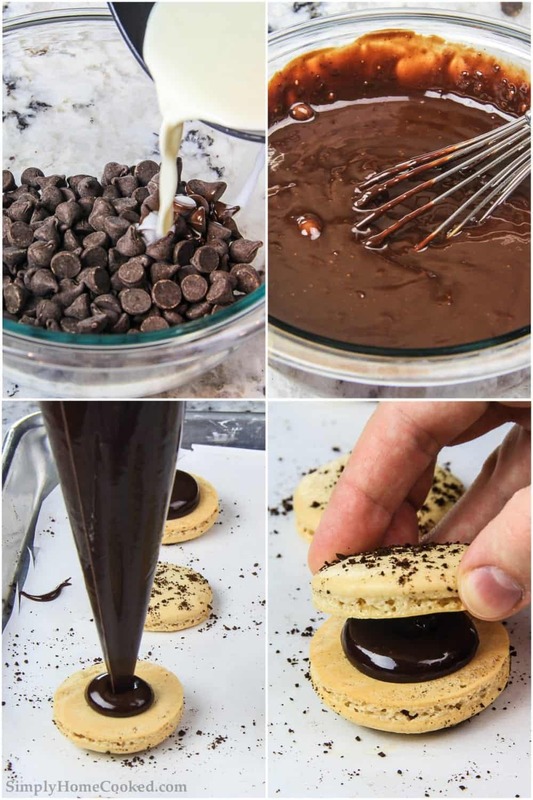 Fill a disposable pastry bag with the chocolate ganache. 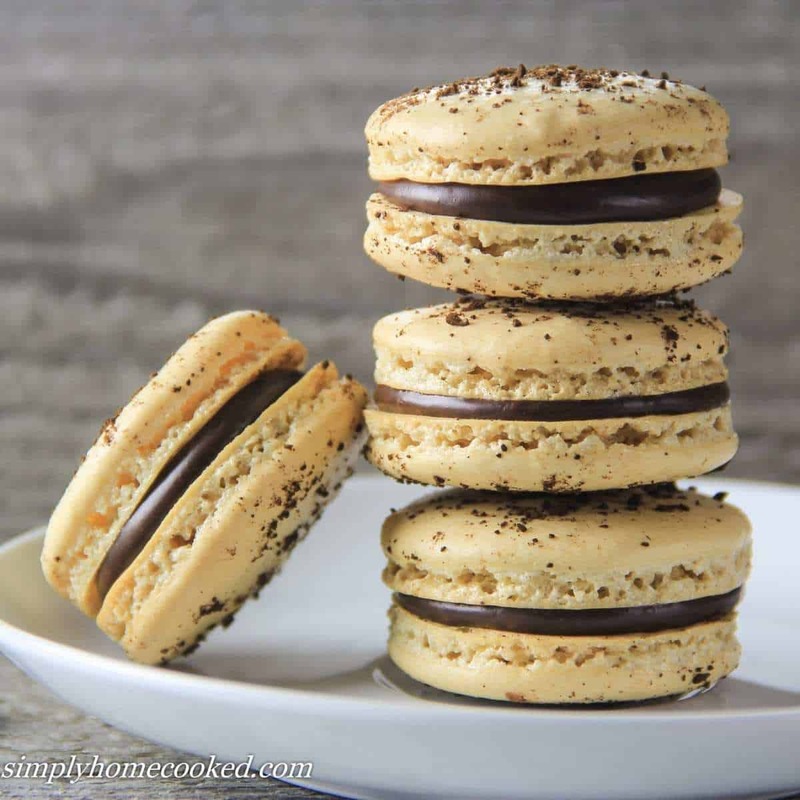 Flip half of the macaron shells on their backs and pipe the chocolate filling onto each sell. Then place the unfilled shell on top. -If not eaten right away, keep refrigerated. 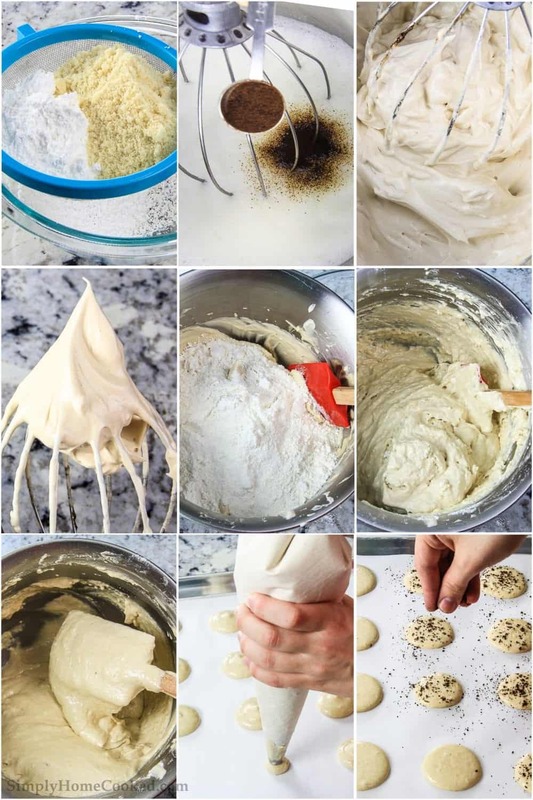 -In the pictures it might seem like a lot of batter because I was doing double the portion for a party, so don’t worry if it looks like you have less batter. 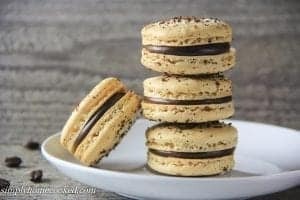 Like French macarons? You might also like these other French recipes. Almond Pear Tart– tart shell filled with an almond frangipane filling and juicy ripe pears. This post contains affiliate links. Meaning we get a small percentage when you click and shop. Your cost is the same. We only recommend things we use and truly love. Preheat oven to 300F degrees. Make sure your oven is on the conventional setting. (or in other words, if your oven has a fan inside of it, avoid having the fan on). Sift the almond flour and powdered sugar into a bowl and mix to combine. 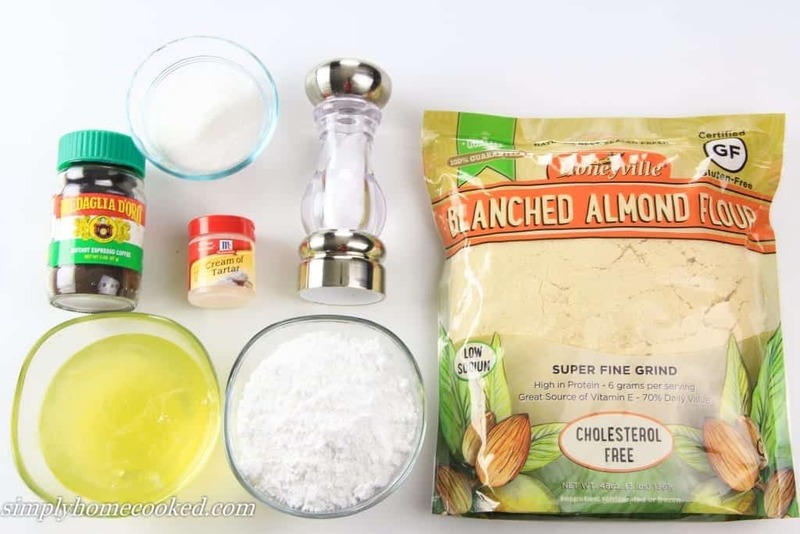 Sifting is crucial because you want to get rid of any larger pieces of almond. Beat the egg whites on high speed until foamy, then add espresso powder, salt, and cream of tartar. Mix for another minute then add the sugar. Beat for another 4-5 minutes or until stiff peaks form. Fold flour/sugar mixture into the egg white mixture. Be careful NOT to over mix. About 80 turns of your spatula should be enough. You want the batter to resemble the consistency of molten lava. I recommend using a large spatula. That way every turn will mix more of the flour into the egg whites. Fill a pastry bag with the batter. Using a circle piping tip about 1/2 inch in diameter, pipe out 1 inch mounds. Make sure to pipe out onto parchment paper. Do not add any grease to the cookie sheets. Take the cookie sheets and bang them onto the counter a few times to get rid of any air. I hit them pretty hard, about 10 times. I like to sprinkle some coffee grounds on top of every mound to give it a stronger coffee taste, but that's totally optional. Let the macarons sit in room temperature for about 30-50 minutes. It really depends on how quickly they become tacky to the touch. If you live in an area with a lot of humidity, it may take longer for the macarons to form the "skin". Bake 1 tray at a time for 18 minutes. Be careful NOT to under bake or else they will stick to the parchment paper. I found that the second batch that sat out while the first was baking tended to burn a little since it sat out longer. So you may want to remove the second batch from the oven a minute or two earlier. Heat the heavy cream in a saucepan over medium high heat until it comes to slight boil. Dump the the chocolate chips into a bowl and pour the hot cream over the chocolate making sure to submerge it. Let the chocolate sit for a few minutes then stir until it becomes a smooth creamy consistency. Fill a disposable piping bag with the chocolate ganache and snip the tip with scissors. Flip the cookies on their backs, and pipe a small mound of filling on one of them. Then place the other cookie on top. If not eaten right away, store macrons in the refrigerator. Ps: we’ve updated a few of our photos. Here are some of our older photos. Thanks for sharing this awesome recipe! It yielded delightful results on my first attempt. I’m sharing my experience in a (very) new blog and I’d love to link to your recipe if you don’t mind for others who might want to try it. I especially appreciate the step-by-step tips for successful cookies- very helpful for a beginner! You rock! I made macarons years ago and it was a major fail, so I was turned off of making them until now. These turned out AMAZING!!! I did not have to make any adjustments to the recipe, and they turned out perfect. I did not have to take the second batch out early so I ended up cooking both trays for about 19 or 20 minutes. This is a new favorite of mine and my friends — I even shipped some off to Maryland! Is this a basic recipe.. it seems better written than the others that ive tried reading! Could i use a purple pastel dye and add it to these? And i wanted to make a buttercream filling. The purple ones are just so pretty! If so, when do i add in dye? To the egg whites after whipped?